Our mission has always been to provide high quality water and dependable service at the lowest possible cost. 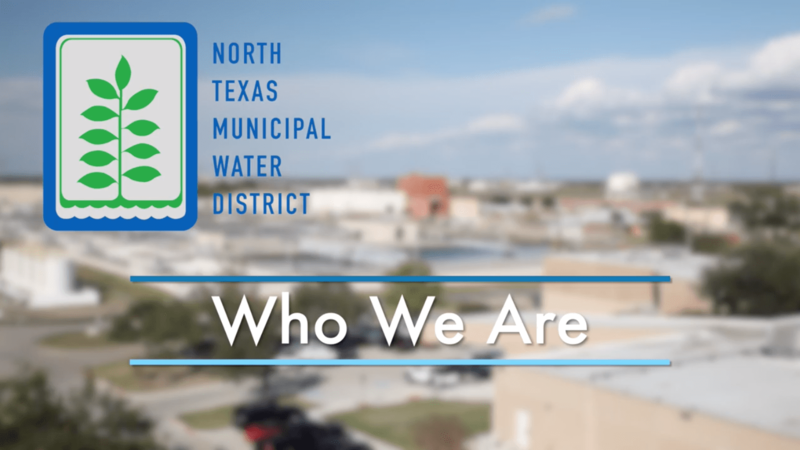 NTMWD is a wholesale water provider serving 1.7 million people in about 80 communities in 10 North Texas counties. The rate paid by water consumers varies by each city we serve as it sets customer rates to cover the wholesale cost as well as local system costs. To ensure a reliable, uninterrupted water delivery now and in the future, ongoing investments are needed to maintain our existing system and plan for and build additional water projects and infrastructure. The wholesale water rate increase of 14 cents (per 1,000 gallons) is effective Oct 1, 2018 to fund critical projects to operate, maintain and expand the regional water system. 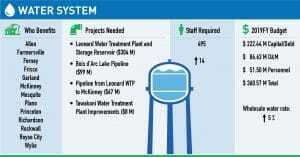 This includes expanding and improving four of our primary water treatment plants in Wylie and constructing two new water projects: Trinity River Main Stem Pump Station and the Bois d’Arc Lake. The approved FY19 Member City wholesale rate is $2.92 (per 1,000 gallons) and $2.97 (per 1,000 gallons) for regional water system Customers. This is still roughly a quarter of a penny per gallon of treated water delivered to the cities we serve. Read more about the FY19 approved budget and key projects. Large capital projects require upfront investment – sometimes years before customers experience the benefit. By funding projects with bonds, we can spread those costs over time so that future users share in the costs. Financing this way requires rate adjustments to maintain our financial stability and high credit ratings. This results in lower interest rates for financing construction and maintenance projects, ultimately saving customers money in lower borrowing costs. As it has worked since the 1950s, the cities and communities we serve share equitably in infrastructure investments that support the operation and maintenance of the shared regional system, as well as ongoing population growth, which is expected to double over the next 50 years. Even with planned rate increases, our wholesale water rates are lower or comparable to similar water suppliers in North Texas. Nationally, our costs are lower than average for combined water services. Customers frequently ask why rates need to go up if they are conserving water. Water rates are not only set by the amount of water used, but for the costs associated with operating, maintaining and expanding our system, as well as to repay debt for existing pipelines and facilities. 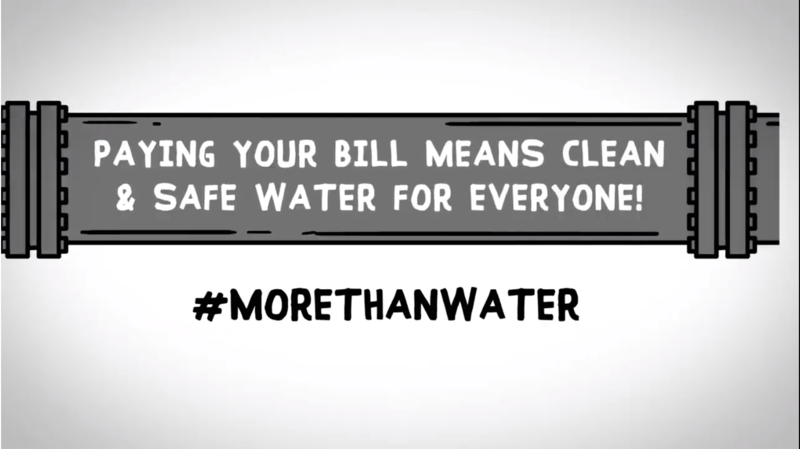 What's behind your water bill? The NTMWD is a wholesale water provider and charges its cities and communities about one-quarter of a penny per gallon for safe drinking water. That covers paying to acquire the water, storage, transportation, treatment and testing, and then delivering it to cities and water providers who in turn, pipe it to North Texas homes and businesses. The cities and communities we serve establish the water rates they charge and bill their customers. They also have to pay for the facilities, pipes and systems to store and distribute water to homes and businesses. Most cities set water rates in tiers based on water usage. The less water people use, the lower their rates. Homeowners who have large lawns and water frequently will usually pay a higher rate. 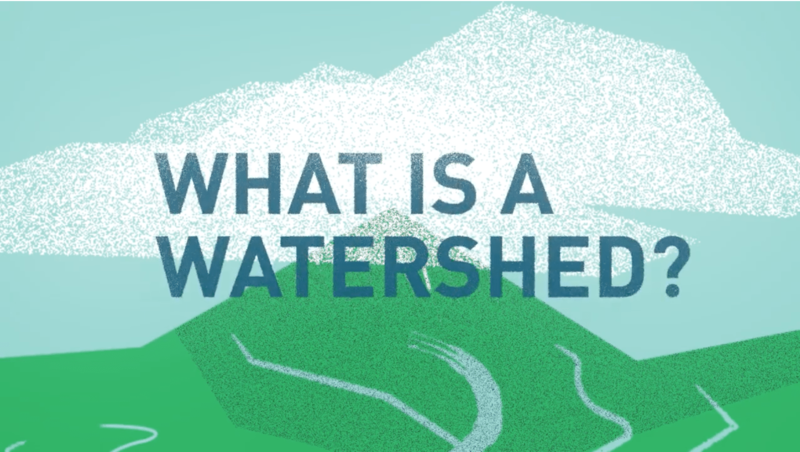 To understand how your community calculates its water rates, visit your provider’s website. We have links to NTMWD Member Cities and Customers at the bottom of our water system page. What does your bill include? Water delivered to a home or office is a service, not just a commodity. For every $1 we charge our member cities, about 15 percent covers the actual cost of water. That cost goes up and down, depending on how much water a community uses. The remaining 85 percent pays for fixed costs. These costs add up and do not change, no matter how much water a city uses. Operating, maintaining and expanding the pipes, pumps, motors, and facilities to capture, store, treat and deliver water. Repairing aging and leaking pipes. Repaying bonds secured to finance new infrastructure and water sources to meet future needs. Meeting strict government regulations to keep water safe and protect the environment. Employing highly specialized technical experts required to do all this work. How can saving water help manage my bill? One of the best ways to manage your water bill is to conserve water both indoors and outdoors. The most water savings are gained by only watering your yard when it needs it – which is usually no more than twice a week during hot summer months. This helps stretch our existing water supplies and may delay the need for new projects we must invest in. It also can make your monthly water bill more affordable. To help determine when and how much to water your yard, sign up for a free weekly watering recommendation at WaterMyYard.org and learn ways to save at North Texas Water IQ. The North Texas Municipal Water District does not use property taxes or any other form of general taxation as a revenue source. Its revenues are generated by the services it provides. NTMWD has contractual relationships with the cities served which allow the District to issue bonds to finance the development of projects needed to provide its services. The State of Texas requires water providers to receive sufficient revenues from the cities they serve to pay their debt service, operations and maintenance costs. The cities must then charge a sufficient amount to cover both our wholesale costs and the costs of operating their own distribution systems. These contracts must be approved by the state Attorney General in order for water providers to issue bonds. What is a contract minimum? Contract minimums assure bondholders that water providers will generate sufficient revenues to satisfy their financial commitments. They also help providers determine the proportional share of the regional system costs to be paid by participating cities and may be established using different methods, such as fixed volumes, maximum day usage, annual average usage over several years, or the previous highest annual usage. The District and its cities have agreed to use the highest annual usage method, which sets fees according to the year of highest use (most water consumed). This is commonly known as the minimum annual demand or the total annual minimum. What is the minimum annual demand? The minimum annual demand is set based on the year of greatest demand for water a city has placed on the regional system. This rate methodology ensures that each city pays for its proportional share of the total fixed costs for the regional system. The fixed system costs must be paid no matter how much water is used. Regardless of how much water a city consumes each year, the District is required to pay to perform maintenance and repay the bonds on the infrastructure constructed to meet the highest potential treatment and delivery capacity. 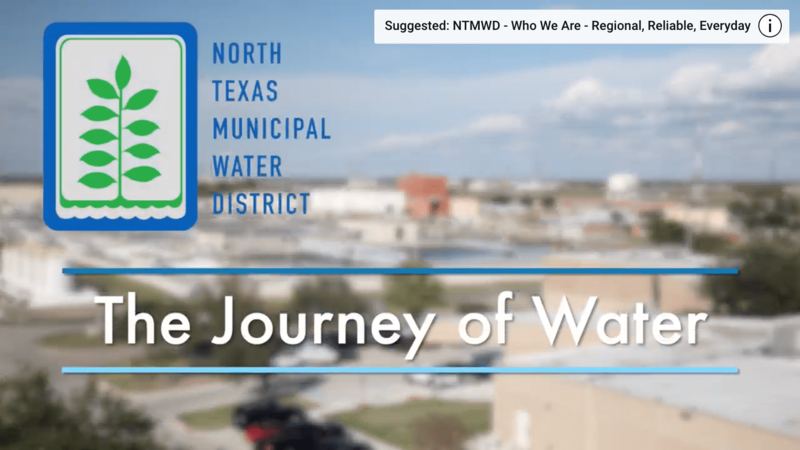 The minimum annual demand ensures that NTMWD has the funding required to develop, operate and maintain supplies and facilities to meet the potential maximum system capacity that each city may need. How are costs allocated to the cities? The NTMWD Board of Directors approves an annual budget that is based on meeting the needs of those communities served by the regional system. The budget is divided proportionally among participating cities according to their historic highest demands on the regional system. Should a city consume more water than its minimum annual demand, the additional water is purchased at a reduced rate to cover the additional electrical power and chemicals required to produce it. This higher consumption of water then becomes the new contract minimum for that city for the following years because NTMWD must be able to maintain the system to meet that additional volume. However, when one or more cities’ set new higher contract minimums, the other cities’ percent share of the total system costs may decrease. Are there rebates for variable costs? 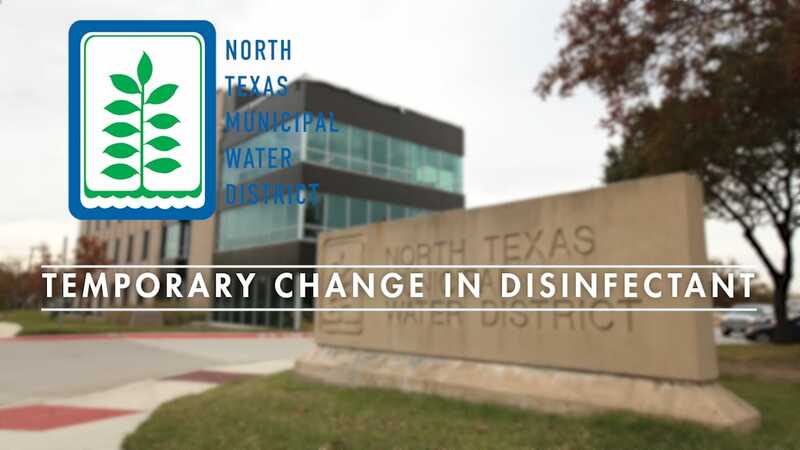 If a city consumes less water than its minimum annual demand, the NTMWD Board of Directors typically rebates the variable cost of operations for unused power (pumping) and chemicals (treatment). The NTMWD must still charge cities to cover annual fixed costs for maintaining the regional pipelines and facilities, constructing capital projects and repaying debt, regardless of how much water is consumed.